For a while now, I've enjoyed riding on carbon wheels. At first they were aesthetic - I wanted depth to the rims to match the frame, but didn't want to haul around the weight of aluminum. But as I started experimenting with rims, I learned that there's so much to offer besides weight reduction. You can get road rims that are mind-boggling in width, affording a plush ride on race tires. Or if you're fast enough, you can gain a substantial aero advantage. I'm not that fast, but I adore them for their stiffness. The crisp response and mind-boggling grip on turn-in of a wide, stiff rim laced to a wide-flange front hub is something you have to ride to truly understand. And to be able to run a wide, seep, stiff rim that weighs as much as a standard double-wall alloy rim? Magic. I built a lot with carbon, and I learned its traits. So when I got the opportunity here to work with carbon rims from Gigantex, I jumped on it. You may not have heard of Gigantex, but you've probably seen their product - they're one of the largest carbon rim manufacturers in the world, and their rims are often stickered and resold by some large brands. The rims themselves are excellent - they have a plain matte finish, a chunky brake track, and a reassuringly thick spoke bed. They feel solid, but not excessively heavy. They're just really nice rims. Built up with appropriate spokes and nice hubs, you can reap the benefits of carbon without ripping up your wallet. This particular set was built up for a local racer. It's mixed-depth, with a 45mm in the front and a 55mm in the back. It's enough to develop some aerodynamic gain, but it's still light and (more importantly) very stable in our midwestern crosswinds. 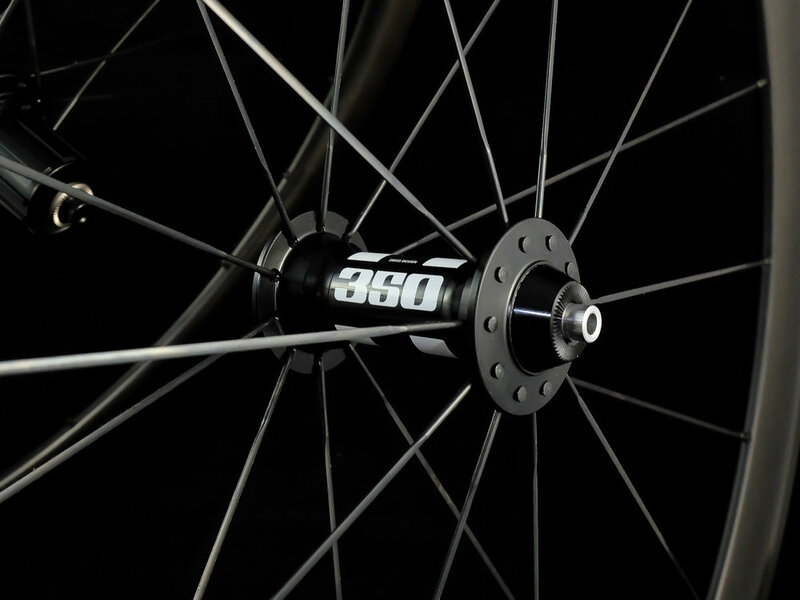 DT Swiss 350 classic hubs are an excellent value for the money. The seals and bearings are smooth, and the overall quality superb. Unfortunately, the rear only has 18 teeth on its star ratchet, so we got some of the guts from DT's top-of-the-line 180 hub and transplanted them into the 350. Now it engages instantly and sounds genuinely mean when rolling up through the pack in a crit, yet costs a fraction of the hub it behaves like. Bladed spokes from Sapim round out the build and the end result is a light (~1400g), smooth, and incredibly stiff wheelset ready to squash dreams in a bunch sprint - for the cost of one wheel from a major name brand. How about that? One of the things I enjoy most about doing custom builds is taking a set of parameters and iterating components around it until I find the right balance of performance and cost. This is a prime example. Interested in some new carbon for your bike? Get in touch, and I'd be only too happy to come up with something for you.